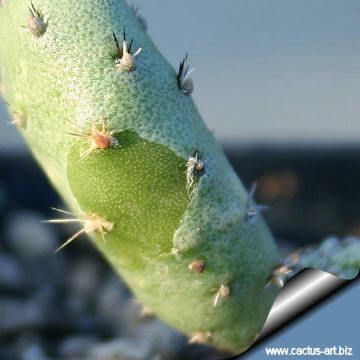 A new cactus chimera, Ortegogactus skin on Opuntia body!!! 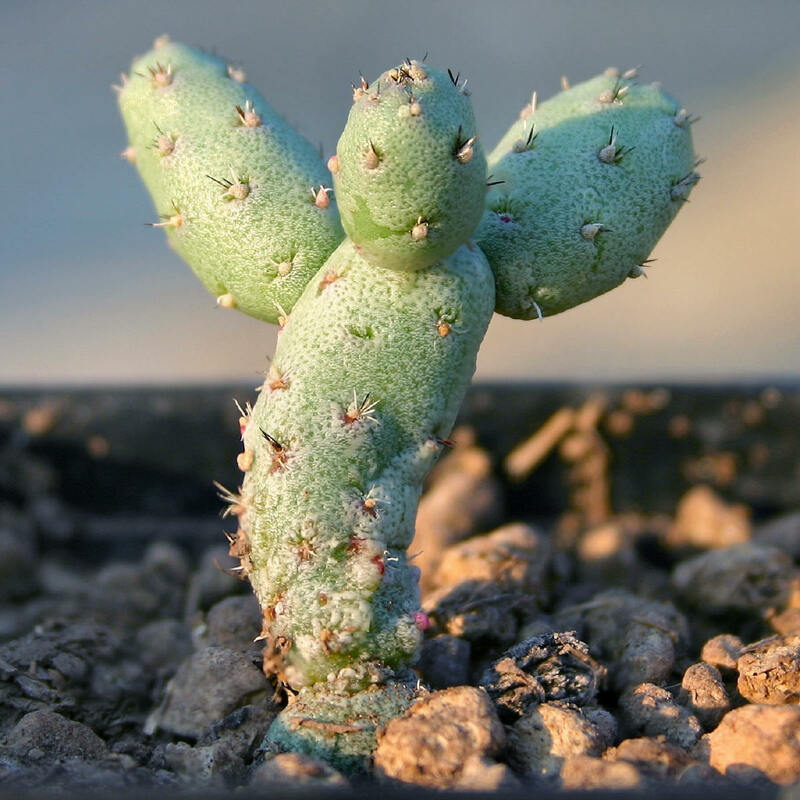 Story: This original plant appeared unexpectedly in plant of Ortegocactus macdougalli graftred on an Opuntia compressa stock, the graft-chimaera sprouted up as a small branch from the point of union of the stock and scion from the callus containg tissues of both species. Description: This is a very slow growing plant with an external layer of epidermal cell of Ortegocactus macdougalli that cover a second inner layer of tissues of Opuntia compressa like a glove. 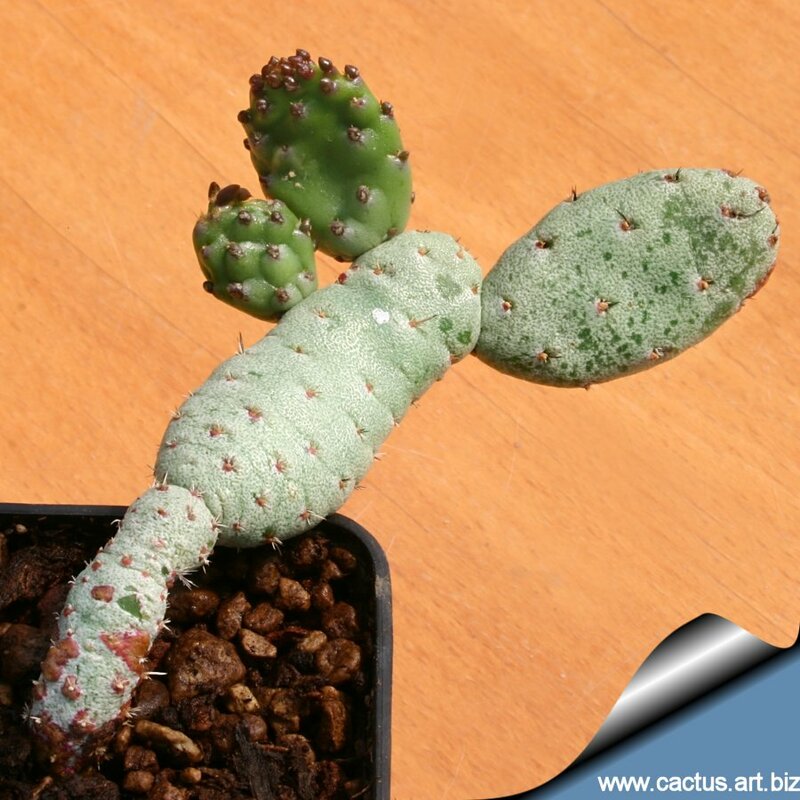 The plant colour is the unmistakable grey-blue metallic tone of the Ortegocactus, but the plant shape is that of a minuscule Opuntia with small irregular cladodes up to 3-5 cm of length. 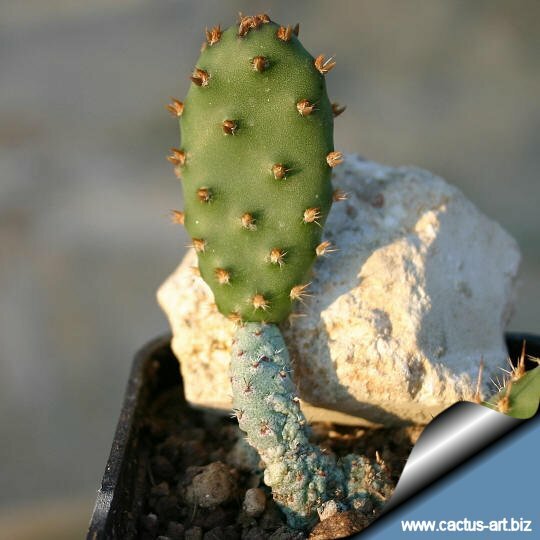 This plant is quite unstable and have a tendency to revert to common Opuntia shoots. Cultivation: We have not a long time for testing the cultivation requirements of this brand new chimera. 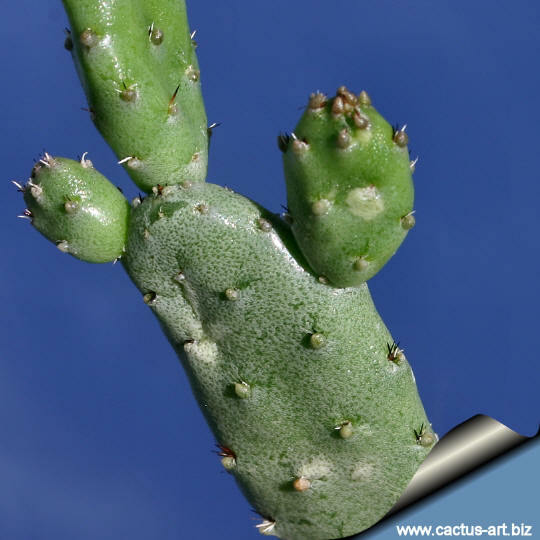 The plant seems of easily cultivation, the main difficulty is to eliminate the shoots that revert to the Opuntia type, it is advisable to water the plant moderately, in fact over-feeding and over-watering may enhance the growth of the more vigorous Opuntia tissues causing the reversion. 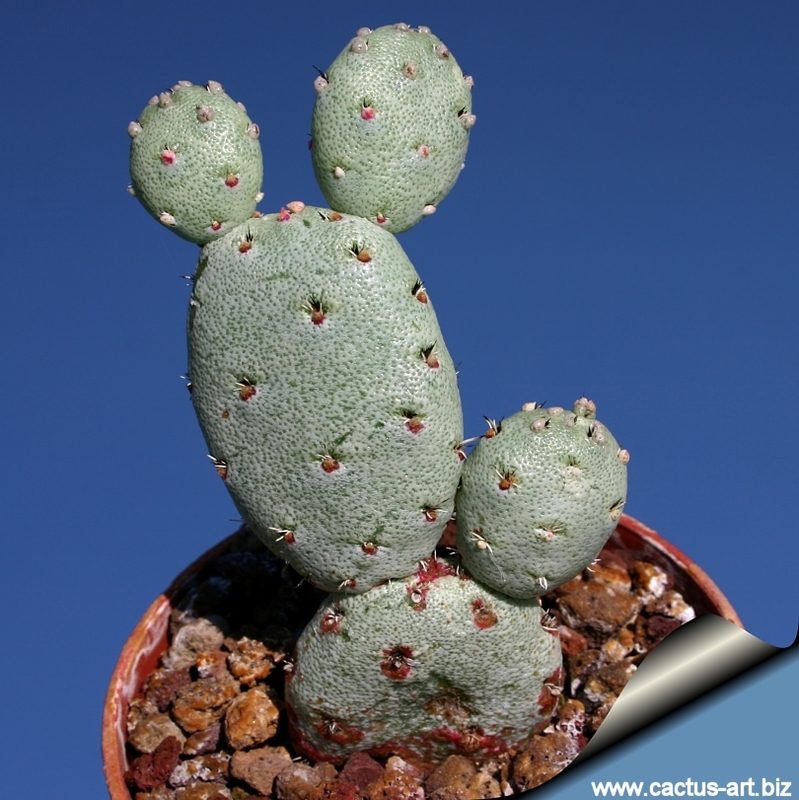 This is a particularly slow growing plant (like Ortegocactus) and needs a sunny and warm exposure, and possibly winter temperature not less than 5-10° C. and good air ventilation. 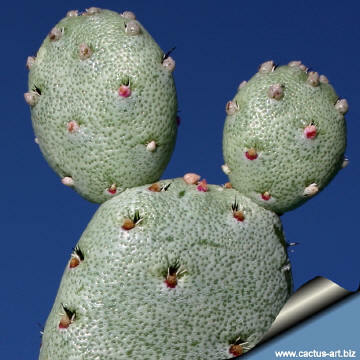 Scientific name: +Ortegopuntia cv. 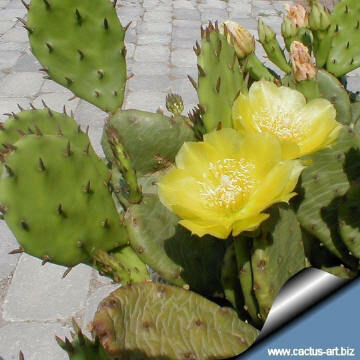 "Percy"
Origin: Garden origin (Nursery produced cultivar) Found and selected in the cactus art nursery in the spring 2004 by Valentino Vallicelli. Conservation status: Listed in CITES appendix ? Etymology: A graft-chimaeras can be given their own genus name (which is a combination of the two constituent generic names) preceded by a + sign. 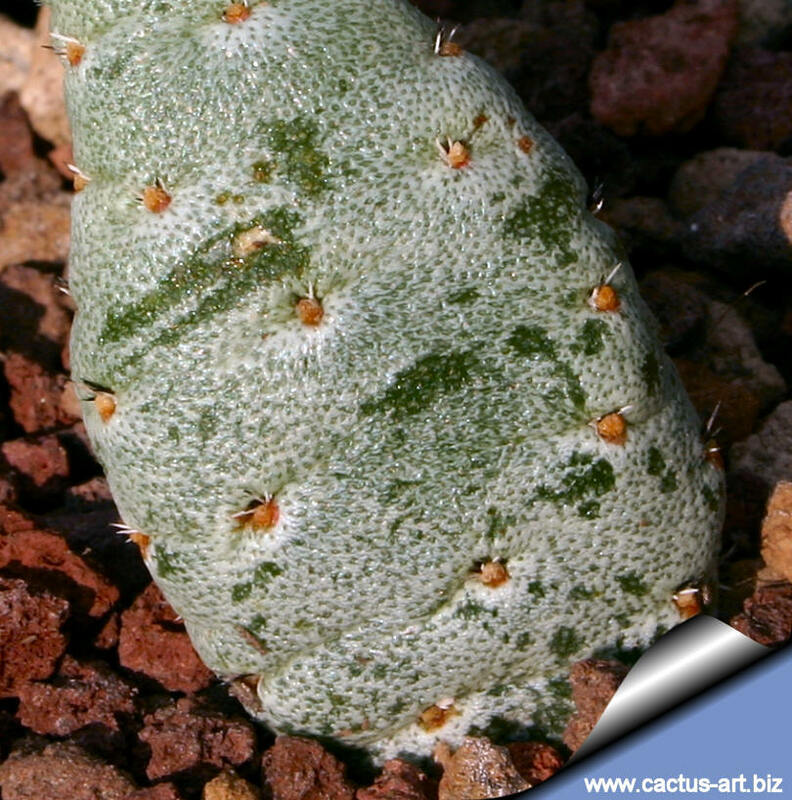 + Ortegopuntia derives from the combination of Ortegocactus and Opuntia. Gymnocalycium mihanovichii v. fleischerianum + Echinopsis tubiflora. Chimeras-graft appear more frequently among Ariocarpus sp. than among any other genus on stock of either Echinopsis sp. 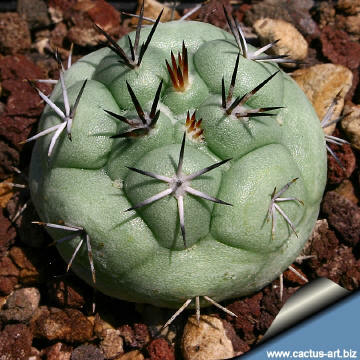 or Myrtillocactus geometrizans. In some ornamental plants chimaeras may be the result of lengthwise implanting and sophisticated techniques, a possible methods include cutting the stem at the midpoint and combining the lobes of stock and scion. It is supposed that the miscellaneous tissues in the joint point can accrete and give life to an adventitious new plant "chimera". But - as we know - nobody till now has succeeded to make cacti chimera on purpose. Circumstances which cause the chimera to appear include huge numbers of grafts.